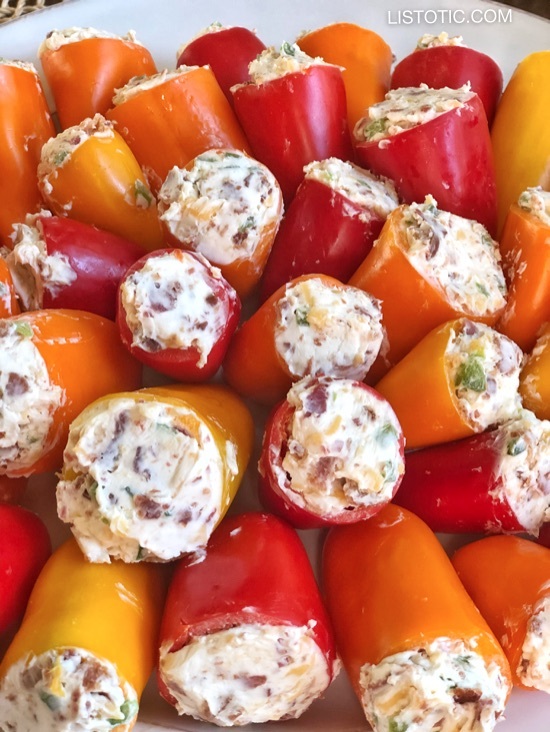 These stuffed mini peppers are SO stinkin’ good and easy to make! I’m always on the hunt for appetizers that can be made ahead of time and easy to take to a gathering, and this one hits the nail on the head. They remind me of a jalapeño popper only not as spicy, and with more of a crisp and refreshing crunch. I don’t know if you’ve ever tried these mild little peppers, but they are super convenient, healthy and fun! I’ve seen many ways to stuff them, but I love this simple 5 ingredient recipe because it’s easy and definitely not missing any flavor. Oh, and did I mention that these little guys are also low carb and gluten free?! Remove the cream cheese from the fridge and let it sit at room temperature for about 30 minutes. This will make it easier to mix with the other ingredients later. Meanwhile, cook the bacon until it’s crispy. I prefer to cook mine in the oven set at 375 degrees on a foil lined baking sheet for about 20 minutes (flip it half way through). While the bacon is cooking, cut the tops off of the mini peppers and clean out the seeds. You can also take this time to finely dice the jalapeños and shred the cheese if you haven’t already. Once the bacon is done and cooled a bit, use a large knife to chop it into small bits. In a medium to large bowl, use a spoon to mix together all of your ingredients except for the mini peppers. Use a small spoon or mini spatula to stuff the mini peppers with the mixture. 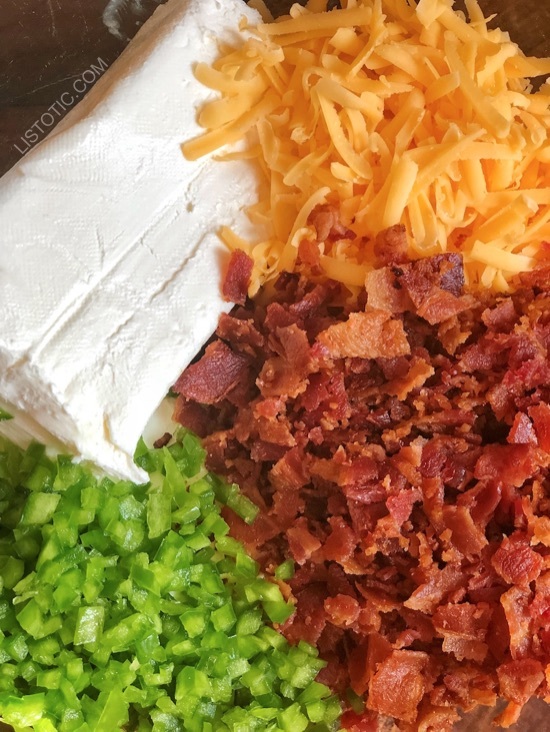 To make this appetizer even easier, you can use bacon bits instead of cooking and chopping your own. This recipe is actually pretty mild. If you’d like to make it a little spicier, consider keeping some of the jalapeño seeds in the mixture. Chives or green onions are also a nice addition to this recipe. I leave them out because my family doesn’t like them. 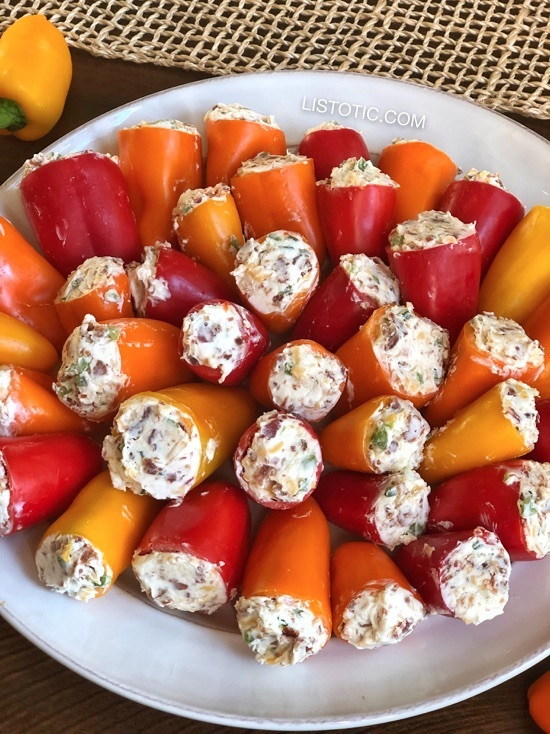 If you have the time, the sweet mini peppers are even better grilled for a few minutes before they are stuffed. 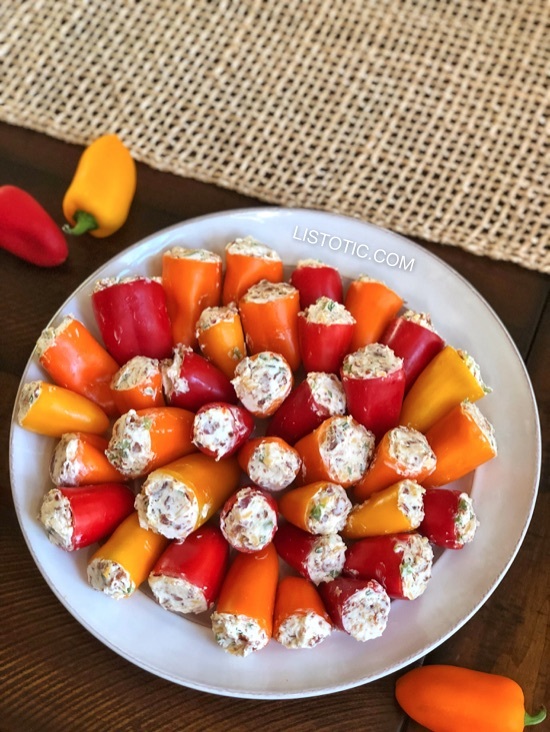 This easy appetizer is the perfect finger food for any holiday or party! I especially like to serve them up for 4th of July.